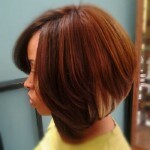 Anika Noni Rose hits the nail on the head with her spiral set bob. The perfect combination of smooth, controlled spiral curls and a few wild “fishhook” ends creates an unique vibe that rivets our attention. If you want to try to make fishhooks in your curls, curl most of your hair as normal, but choose a few small sections to apply the following technique: Just avoid leave out the ends of your spirals when you use the curling iron rather than tuck them in the clasp of the barrel of your curler. We also love Anika’s unexpectedly colorful gemstone earrings, chinkling gold necklace and black beaded frock. This short black curly bob hairstyle is great for oval, round, square, oblong face shapes.